Okay, new rule: These Candied Almonds are NOT allowed in my house. I’m bringing them with me to work tomorrow. Hopefully I can survive the night without eating them all. These are some dangerous little almonds… very dangerous. But say you need a gift to bring to a holiday party and wine isn’t up your alley. These would be perfect! Or, you like to give homemade gifts for Christmas – everyone will love you. I mean really, really love you. This recipe makes about 3 times what you would get in one of those little cones from the mall kiosk and for about the same price. Now that you’ve unlocked their secret, the smell of sugar coated roasting nuts wafting from their kiosk will no longer hold any power over you. You are free. Make sure you let your almonds cool completely at room temperature before packing them up. This makes sure there is no residual moisture in the nuts that can cause them to get sticky or moldy during storage. Once cooled, pack them in an air-tight container and keep for up to one week at room temperature. 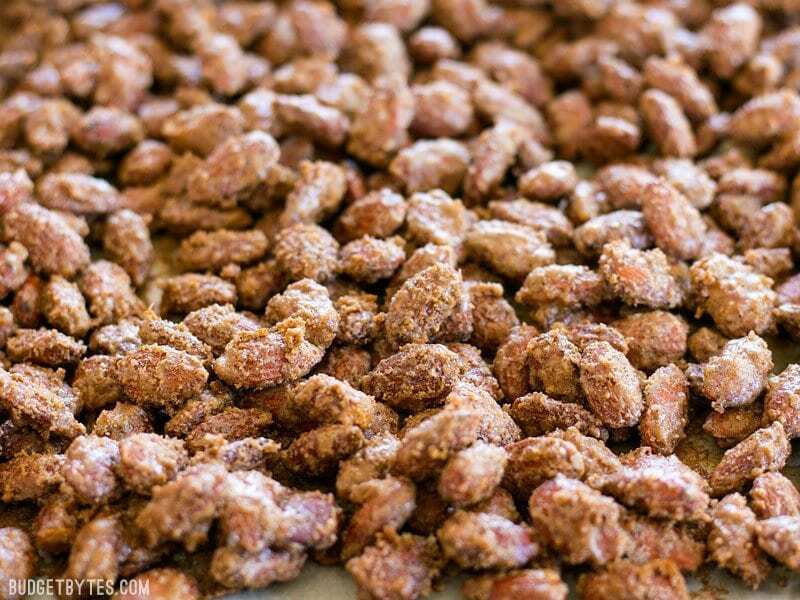 Homemade Candied Almonds are a fraction of the price of store bought and make great homemade gifts for the holidays! Preheat the oven to 300 degrees. 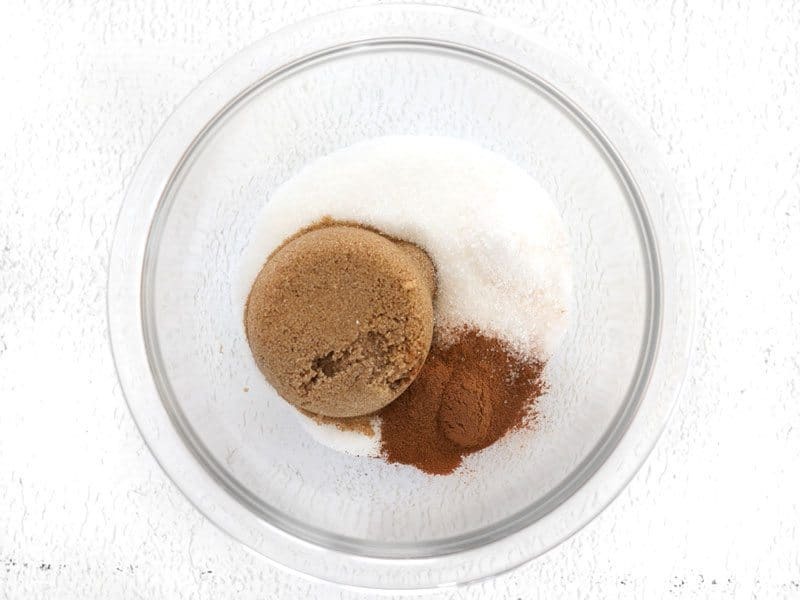 In a small bowl, stir together the brown sugar, white sugar, cinnamon, and salt until evenly mixed. Separate the egg white from the yolk. 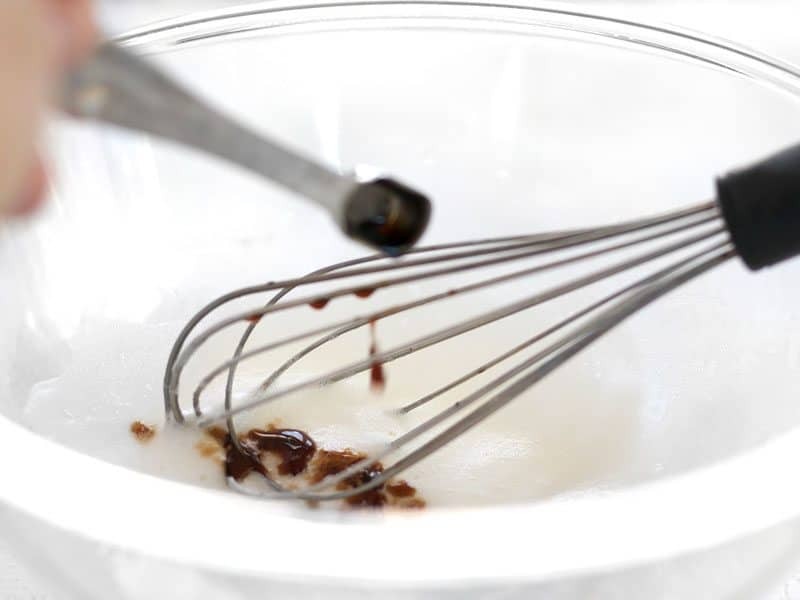 Place the white in a large glass or metal bowl and whisk until light and frothy, but it is not yet forming peaks (no clear liquid should remain in the bottom of the bowl). Add the vanilla extract and whisk again until incorporated. Add the almonds to the egg whites and stir to coat. Add the sugar spice mixture and stir to coat again. 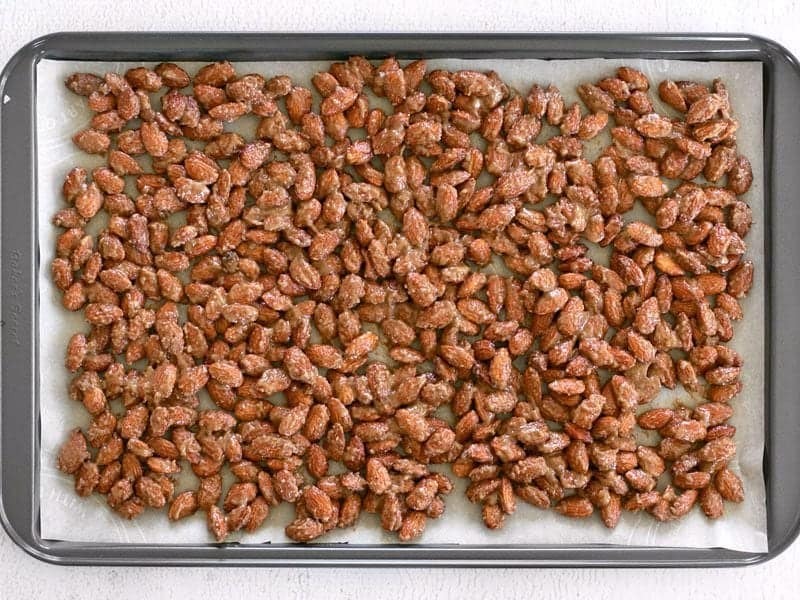 Spread the sugar coated almonds out on a baking sheet lined with parchment paper or foil coated with non-stick spray. Bake for 30 minutes, stirring once half way through. 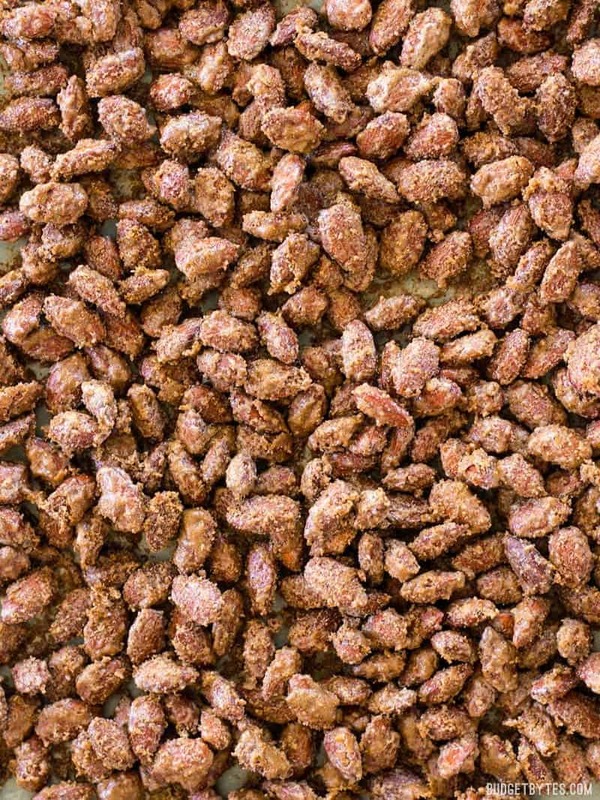 After baking, allow the almonds to cool, during which time coating will solidify into a crunchy candy shell. 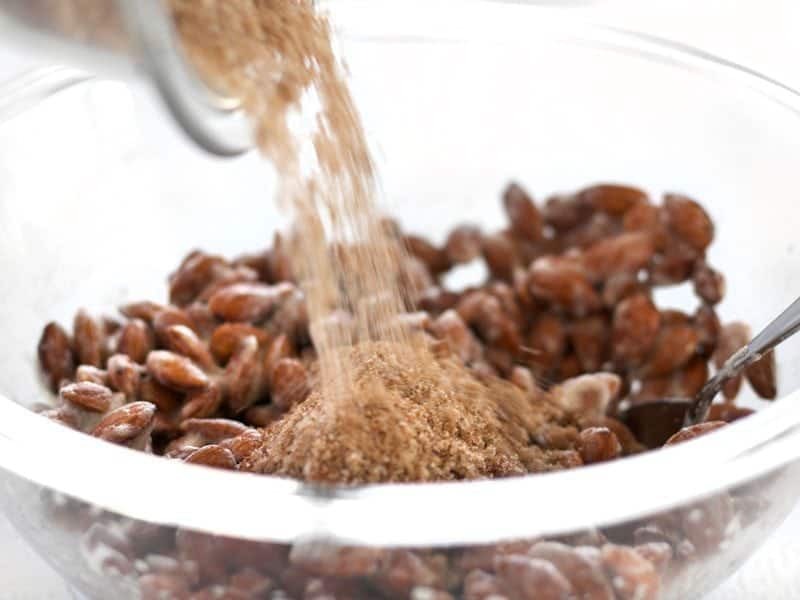 In a small bowl, stir together 1/3 cup brown sugar, 1/3 cup white sugar, 1 tsp cinnamon, and 1/2 tsp salt until evenly mixed. 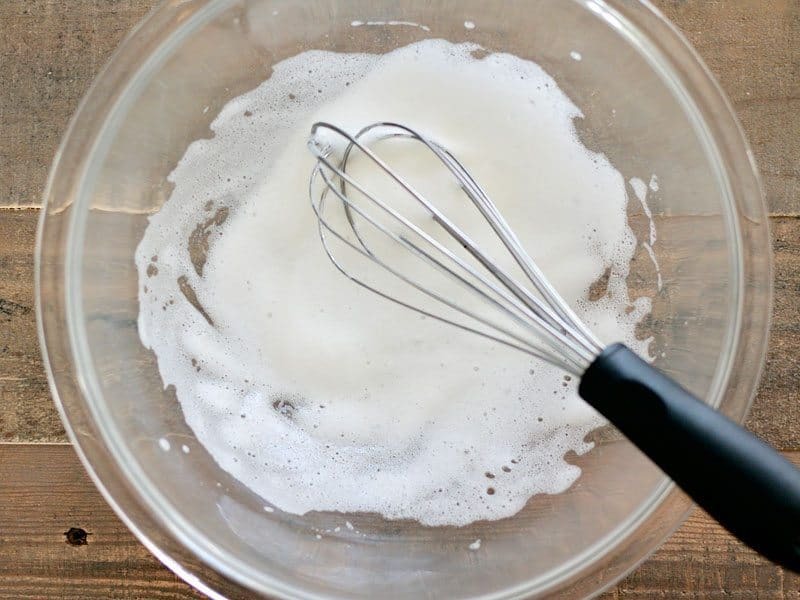 Separate one large egg and whisk the whites until they are light and fluffy, but not yet forming peaks. Make sure there is no clear, liquid white left on the bottom of the bowl. Add the almonds to the egg whites and stir to coat. Add the cinnamon sugar mixture and stir again until coated. Spread the coated almonds out on a baking sheet covered with either parchment paper or foil coated with non-stick spray. Bake in a preheated 300 degree oven for 30 minutes, stirring once half way through. 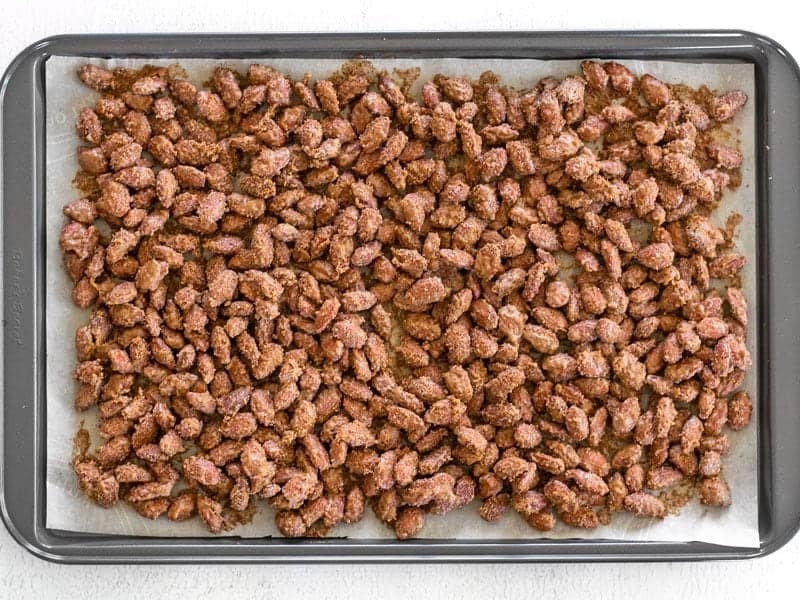 After baking allow the almonds to cool so that the candy coating can harden and get nice and crunchy. Thanks so much for this recipe! Easy and delicious. For the 2nd year now I’m making batches to give away for Christmas gifts. Everyone loves them! Whomever rated these less than 5 stars is living their life incorrectly. Thanks Beth! Hi Beth! Do you think it would work to use salted almonds, and then omit the salt in the ingredients? That might work! :) It’s hard to guess, though, since I don’t know how much salt the salted almonds bring to the table. I absolutely loved the candied almonds!! 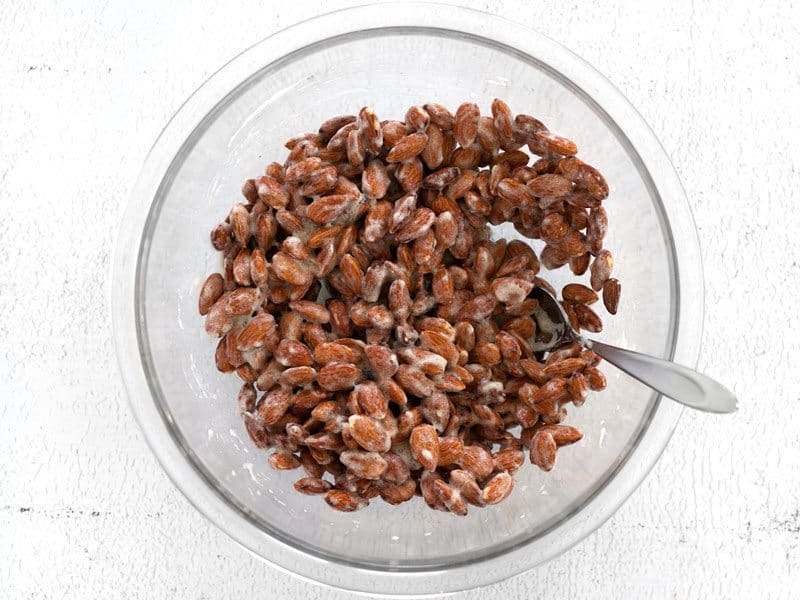 If you tast the syrup in the bowl it is amazing and even more delicious on the baked almonds! You NEED to try the recipe!!!! Made these today, and the kitchen smelled so good! I can attest to them being addictive; I wanted to eat the whole batch in one sitting. These were kinda grainy to me. I followed the recipe exactly but I feel like they need more egg whites to get all the sugar, so there aren’t so many grains of sugar all over. my daughter brought some back from the Christmas Market in Germany, only they used Irish Cream. Any idea how to go about using a liquid. They are so nummy! Is there any way i could replace the egg? for someone who is vegan? 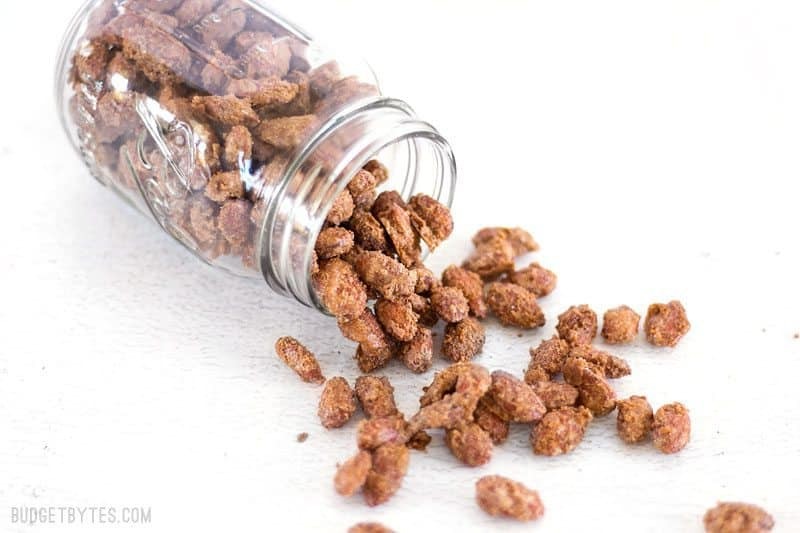 I’ve seen recipes for candied almonds without egg before so I know they’re out there, but there is no quick substitution for this version, unfortunately. You’d need to use a different technique all together. These are wonderful! I add a touch of ginger and these are gobbled up in an instant! Great recipe, major hit this holiday season and couldn’t be simpler. These look amazing! Almonds and cinnamon are soo good for you too. I usually eat a handful of almonds almost everyday. I just made these but I used Pecans instead. Almonds are too hard to bite and momma likes Pecans. They turned out perfect and the family loves them. I have added this to my recipe book. Thank you! 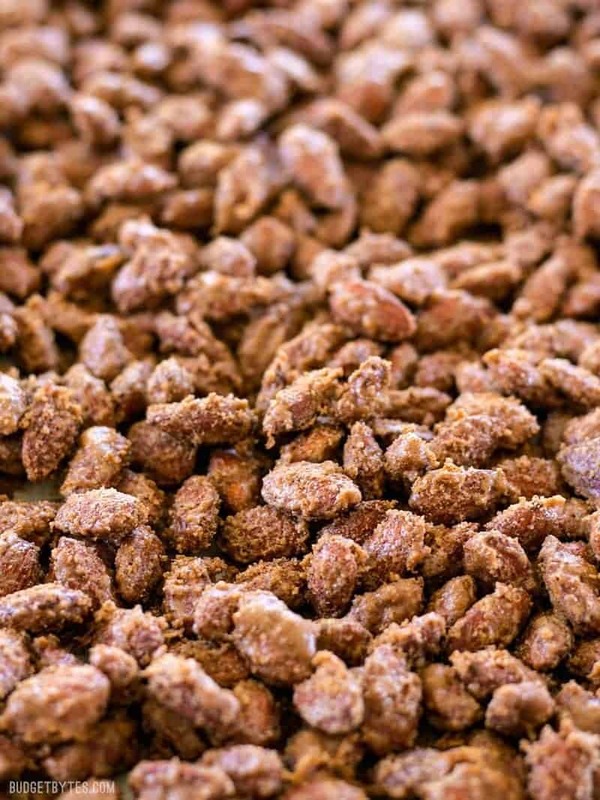 How long do the candied almonds stay fresh for ?